My life is complete today* because I have had 2,300 retweets of a comment I made yesterday after listening to John Humphrys "interviewing" (= having a chat with) David Davis MP on the Today programme. 2,300 RTs meant that it had been seen by some 236,000 people, 8.5000 had engaged with it in some way. 160 people had commented on it. 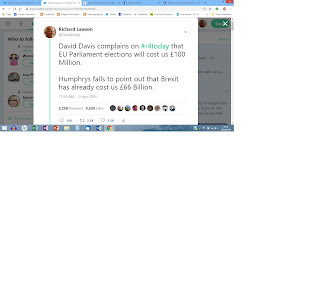 This level of agreement (and nearly all comments were in agreement) shows a large reservoir of dissatisfaction with Brexit and its cost, with the Today Programme's coverage of Brexit, and their weakness for interviewing David Davis (who is a mate, it seems of Humphrys), and with the BBC. The £66 Billion figure came from an audit by Standard & Poor, who calculate that Brexit has shaved around 3% off the GDP. Another £4 Billion comes from making the country ready for NoDeal, and another £1 Billion was the payoff to the DUP (which didn't work, though nobody seems to mention this). So Brexit has actually cost us £71 Billion so far. As a check, Goldman Sachs reckon that the country loses £600 Million a week because of Brexit preparations. That's £30 Billion a year, £90 Billion over 3 years, with more to come. So the figures from the two accounting megastars are about £20 Billion adrift, but let's not fuss over trifles. Speaking of trifles, several people mentioned Chris Grayling, but his contribution to Brexit costs, mainly for engaging that freight company with no ships, but this was a modest £33 Million. 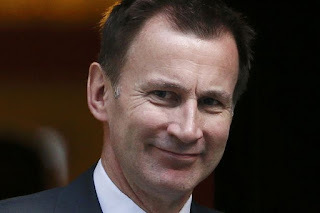 However, he has, over his illustrious political career, lost a magnificent £2.7 Billion (yes, Billion) through various little slips . Cybnics say we are turning into a banana republic, but that is an outrageous slur. We will never be a banana republic. We are, and will always be, a Banana Monarchy. God Save the Queen.